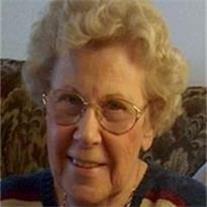 Dona Belle Ortlund, 93, died on Saturday, August 4, 2012 in hospice care in Mesa, AZ. She was born May 6, 1919 in Sioux City, IA, the daughter of Harry E. and Nellie A. Shoberg. She grew up in Sioux City and, on April 21, 1942, married her life-long mate, Robert B. (Bob) Ortlund of Des Moines, IA. Eventually, the Ortlunds moved to Arizona where they raised two children, gave generously of their time to church and youth activities and enjoyed the beauty of the Southwest. Dona Belle was a gifted pianist and organist and particularly enjoyed accompanying the church choir, which Bob conducted. They were a team in every sense of the word. Dona Belle retired in 1983 after over 25 years of service with the Mesa School District as executive secretary to at least two high school principals. Dona Belle is survived by her husband Bob, her son Robert A. Ortlund of Payson, her daughter, Charlotte Wells of Kingman, three grandchildren (Sarah, David and Breanna) and two great-grandchildren (Faith and Zion). Arrangements by Bunker’s Garden Chapel, 33 N. Centennial Way, Mesa, AZ 85201.